I was browsing the Missouri Entomophagy page on Facebook recently when I spotted a post about Chapul Cricket Bars. I've been rolling around the idea of eating bugs. (After all, they eat my garden, so why not give them some payback, right?) Eating bugs that have been neatly processed by someone else seemed like a great place to start. 🙂 Note: For those who are not familiar with the term, “Entomophagy” is using bugs for food. What are Chapul Cricket Bars? Chapul cricket bars are energy bars made from a combination of ingredients, including cricket flour. They currently come in two flavors, the Chaco Bar and the Thai Bar. The Chaco Bar was inspired by the Chaco people of American southwest, who practiced extremely efficient agricultural practices using the Three Sisters – corn, beans and squash. The Chaco Bar has a Peanut Butter and Chocolate flavor. The Thai bar was inspired by Thailand and Thai cuisine, which includes a wide variety of insect recipes. It contains coconut, ginger and lime. The ingredients in the Chaco Bar are dates, peanuts, toasted oats, chocolate chips, walnuts, agave nectar, cricket flour, flax seed meal, and salt. The ingredients in the Thia Bar are dates, almonds, cashews, agave nectar, cricket flour, coconut flakes, ginger, lime zest and salt. As you can see, they're not really all that different from other energy bars on the market, except for the sustainably harvested protein source. 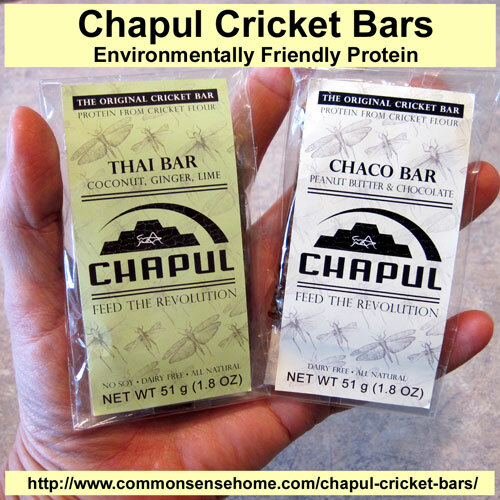 What do Chapul Cricket Bars Taste Like? That's the million dollar question, isn't it? I'll be honest – it was just a little bit anticlimactic to finally take a bite – not a leg or antenna in site. 😉 The bars are dense and mildly sweet, similar to a Larabar style bar. The Chaco is loaded with peanuts and chocolate, and was my personal favorite. The Thai has a distinctive ginger zing. The friends who tried them thought they were pretty tasty, too. My favorite taste tester was the five year old daughter of a close friend of mine. She gave her piece of bar a suspicious look when when told her it had crickets in it and took a dainty nibble – then quickly chowed down on the rest of it. Why would you want to eat bugs? Those who have been on the site for a while know that I am big on supporting genetic diversity through the use of heirloom seeds and heritage animal breeds. I firmly believe that the more diverse are diets are, the better chance we have of getting all the nutrients our bodies need. A more diverse food supply is also a safer food supply. If one crop fails, you can other crops as back up so there isn't mass starvation (no Irish potato famine). Insects can be raised in less space with lower inputs than conventional protein sources. Chapul also invests 10% of all profits in water conservation in the regions which inspired their bars. This TED presentation by Marcel Dicke is one of the original inspirations of the Chapul bar creators. Can the crickets transfer any diseases? This question was asked by a friend of mine who is a little concerned about my latest undertaking. The answer is, “No”. During processing, the crickets are baked. This sterilizes them and completely dries them out. They are then milled into a “flour” which is used in the bar. There are no antennae or legs (as mentioned above). Where can I buy Chapul Cricket Bars? Chapul bars can be purchased at select retailers nationwide (see store locator page) or ordered through their online store. They were featured on Shark Tank on March 21, 2014. You may also enjoy our Herbs and Wildcrafting page, including the post Eating Bugs – Free Food from Your Backyard. We also feature other environmentally sensible product reviews and ideas on our Green Home page. I would like to try the Thai bar. In my botany class we did a potluck as our final project that had to include something from all of the kingdoms. My lab partner made chocolate covered grasshoppers. I wasn’t brave enough to try it then but John the Baptist ate locusts in the Bible. It’s not like it’s unheard of. The Chaco sounds tasty but I can’t eat oats and I love Thai food so I think my kids and I would like that one. If I can be brave enough, I’d like to try the chocolate/peanut butter flavor! It might take me a little while to warm up to the idea of eating ground up crickets but hey, it’s worth a try! When I was young, I tried chocolate covered grasshoppers. They tasted like chocolate covered popcorn! So, I’d give the chocolate peanut butter one a try! Why not! Id try the choco bar. Chocolate anything is good! I’m not sure I could get myself to try them but I know my husband would. I bet I can’t eat just one! At least that is what I’m telling myself! Let me give it a lick, chick!! They have a lot of soluble fiber, so one would probably fill you right up. I’ve been rationing mine so I could give friends a taste. I would like to try the Chaco ones, In my third grade class we tried oatmeal cookies made with earthworm protein once. They were pretty good. This sounds interesting. I would love to try either flavor. I am always looking for alternatives to add to my food stock. I want to try both. Is the thai flavor spicy? I have been interested in the milling process of bugs for protein. The chocolate peanut combo sounds tasty. A free taste test would be awesome! I would love to try the chocolate ones. My kids always tell me they want to eat bugs, but they are too pricey to but for all of them. It would be nice to be able to let them have one of these. I ate a ground hog, why not try a cricket? They both sound good but I think the Chaco sounds best. I’d like to try the Thai Ginger, sounds tasty! We raise worms, mealworms, and wax worms and have tasted all three. Bugs are a sustainable protein frontier! I think this product is great for bridging the gab between “repulsive” and “possible” for lots of people. I would love to try them! Either one sounds like they could be an eye-opening experience! It really sounds like a painless way to be introduced to the insects-as-food idea. Thanks for the chance! My girls are dying to try eating bugs! I think the Chaco sounds like an easy way to try them! I would love to try the thai bar. I love thai food, so why wouldn’t I love this? 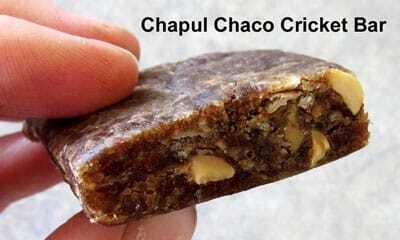 Also, crickets seem to be healthy, so why wouldn’t I eat Chapul? Ah yes, buuugs. Kinda disappointed there’s no legs, I wanted to freak-out my grand kids…lol. I think eating dead and processed bugs would be something I could get use to especially if they’re mixed with other tasty ingredients. If it was good enough fro John the Baptist they should be good enough for me. I would like to try the chaco because I would not have a similar non-hopped bar to gauge it against. I’d try the chocolate one for sure! I’d luvst ta try the Thai! I would try any flavor. When I was a kid I used to buy Cricket Lollypops. Some had Crickets, some had grasshoppers and some had mill-worms. I loved them! When I was in Highschool I used to buy them by the box and sell them to my classmates (for profit of course) but we all loved them! We used to joke that they were like “Blow pops that crunched” (LOL). OK…..Gotta try this one!!! the Thai Ginger one sounds interesting….. I would love the peanut butter choco bar! I’ve had homemade white chocolate cricket bars, they’re so good. I asked the local Whole Foods about stocking these and they seemed interested! Would love to try these, especially with a local distributor. I want to try the chaco bars. I would lov to try the Chaco! Choco sounds like it would be good. I have tried the chaco bar and I love it! I first got interested in eating insects with the philosophy that you are what you eat. I am looking to use these insects to open up my instincts more and awaken my iner antenna to better follow my path and be a strong receiver for life force energy to move through me. What an amazing idea! I always laugh when people are squeemish about eating bugs but eat hotdogs (now that is gross, and delicious). I wonder how much is lost during the sterilization process though, will have to study it more. This sounds fascinating! I always tease my kids that I’m making fried grasshopper legs for dinner. Forgot to tell which I’d like to try. Both! I stepped on a cricket one time and it was filled with a very large amount of long squirmy worms..UGH !!! Not so sure I could eat them after seeing that …. Definitely the chocolate and peanut butter. I’d love to try the Thai flavor bar. I’ve eaten chili garlic stir fried mealworms and enjoyed them! Why am I entering this? Crazy yes, but I just can’t help myself. I’d like to try both! The Thai bar looks lovely! The Chaco one sounds amazing actually. I love larabars and I bet you can tell a difference at all. I would love to try the Thai. I can’t eat the peanut on, but my son would be game. Crickets / Grasshoppers all the same. Full of nutrition. Work great in Bread!!!!!! I am all about trying new things and have nothing against eating insects. Chocolate, peanuts, and crickets? What better combination? I love Thai as well, but hard to beat anything chocolate (and cricket, of course). Any and all of those little bastards wood be fine. I might even share them with the cat! I am really interested in the Aztec bar. The infusion of chocolate coffee with pepper sounds delicious. The thought of eating bugs does not at all sound bad. It seems from the stigma at a early age of bugs being filthy why would one want to eat one. Either way alive or dead full or powdered. It would be a very interesting try as well to share with others. I tend to be decently active mountain biking,bass fishing to model railroading to spending a lot of time on the computer. At times I do need energy a lot of it. Even more so with bad insomnia. This bar not just for the energy sake sounding great but eating bugs. Would be a perfect substitute to get away from energy drinks with pure sugar.